What a welcome sight Restrepia iris is on a cold, wet, dark January morning. The flowers of this species (our clone anyway) have the most vibrant red stripes on a yellow ground and rather comical red blobs on the end of the thin dorsal sepal and lateral petals – like a little alien! 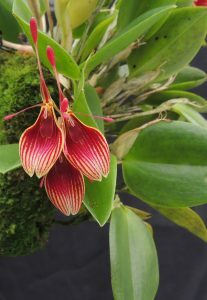 The species is another Ecuadorean endemic where it grows in cool wet cloud forest from 1400-2500m altitude. We grow it in a similar way to all our restrepias – mounted on cork, potted in a basket or in a pot, grown cool, shady and wet in Cool Americas (Min 12C).